I recently purchased the new Merrell Trail Glove after 3 weeks of research and apprehension, and procrastination. I love my KSO's, but found the constant questioning from people to be beyond annoying. (Not many people point and make fun of me, I have that cranky, big old man "I will kill you" because I have with nothing to lose look) . I spent time in the stores wearing them. I simulated rocks by throwing objects on the floor and running over them, I was driving the sales staff crazy, trying shoes on without socks, running around the store and then leaving without making a purchase...In a weak moment last week, I caved in. So, I new that I wasn't going to be totally happy. But at $110, I figured it wouldn't hurt my wallet too bad. I took them to a local trail about 5K long with killer hills. I loved the weight of the new shoes at 6.2 oz. and the zero lift heal. BUT, I immediately noticed the lack of tactile feedback. The sole is entirely too thick! I was able to run across a rock road without any feedback. In my KSO's, I had to skirt the edge of the same rocky road due to the "positive pain feedback". After about 2K I noticed that my BFR form was not being maintained. When I let my mind drift, I caught myself over-striding and noticed my "landing" to be loud/hard. I was putting my foot down , instead of picking up. In other words, I was not running lightly. After 4K, I came to the realization that these shoes were never going to pass my test for barefoot styled running. This was expected..
My conclusions, The Trail glove has its place in my life. I will wear them as everyday shoes as a compromise to my over-supported Nikes. They will limit the questions about "those finger shoes", and decrease the the "your jumping on the band wagon" or "I can't believe your buying into that fad" comments. I will also wear the Trail Glove when running on muddy trails. 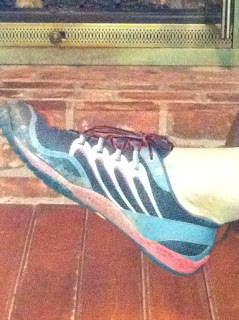 The added traction on the sole that detracts from the tactile feedback will come in handy on the muddy trails. I find that my KSO's are very slick in these situations. Although the Trail Gloves come with antimicrobial "anti stink" lining (another layer between my feet and ground), I found my feet to be very sweaty while walking around in everyday situations. I am using powder now to try to help with that. I also found the toe box to be large. I have wide feet and usually happy with the wider toe box. I think people with slimmer feet may have a problem with the added room. Another design note, I had to stop and empty out the trails dirt and little sticks that snuck into the shoe around the ankle area, not a problem with KSO's. From another point of view, my wife, Gayle, also purchased the Merrell Pace Glove (the female version). She has been wearing them as everyday shoes and have found new muscles. This indicates to me, that she has found her shoes, in her situation, to be beneficial. She has NOT trained barefoot or minimalistic prior to her purchase. I think that she was the target audience for Merrell: People who want to try or transition to minimalistic. I want to be clear about one thing...NEITHER MERRELL SHOE IS EVEN CLOSE TO BAREFOOT! They are more like an introduction shoe for people who want to consider minimalistic training. 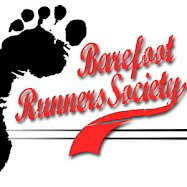 From Shod to minimalistic...Barefoot Tyler and other BFRs will tell you, its best to start to run totally barefoot first to get the maximal tactile feedback, develop your form, then pull back to minimalistic.. I have to agree! It is a compromise with the so called "real world". I wear them without socks, nobody notices them and I can be "semi-minimalistic" while fitting into society. (If I had my way, I would live in VFF's or barefoot). So I will probably buy another pair when I wear these out.But will shop for something more minimalistic at that time. Alas, I am still waiting for a Vibram NO Finger version for everyday, society excepted use. Good review, I've been thinking of getting a pair. I Think I Found My Plan!